2nd Annual PAWS-Beautify CNMI Boonie Dog Show! The much anticipated, twice postponed, PAWS and Beautify CNMI! annual dog show is scheduled for June 7, 2008 from 4:00 p.m. to 6:00 p.m. at the CPA Airport Field. The exact location of the show will be at the southern end of the field underneath the Flame Trees. The dog show was originally scheduled for May 17, 2008, but was postponed when PAWS President Katie Busenkell was invited to attend the United States Humane Society’s Animal Care Expo, a convention on animal care and welfare. “It was an opportunity for networking that we could not pass up,” said Busenkell. Everyone is invited to attend and participate in the dog show, which is a free event. It is a fun activity for the entire family, including boonie dogs. All dogs entered in the show, or present at the show, must wear a collar and have a leash. For those dogs that are able to attend the show, owners may enter their dog(s) to win prizes in the following categories: (1) The Fattest; (2) The Most Disobedient; (3) The Best Belly Dragger (for smaller breeds); (4) The Best Geriatric (for those older dogs); (5) The Most Like a Movie Star; and (6) The Booniest. A prize will also be awarded to the dog that wins the title, “The Best of the Worst,” otherwise known as the best of show. Prizes include Frontline for fleas and ticks, flea and tick shampoo and dip, dog toys, dog food, and a dog bed, just to name a few of the items that have been generously donated by Costco and/or purchased with funds donated by Beautify CNMI!, Angil Designs, Inc., and the PEW Charitable Trust. “And, if you have a cat, or many, you are invited to enter our $1.00 raffle for cat-care items,” said Simms. Forms can be downloaded at www.paws-saipan.org and emailed to Katie at busenkell@gmail.com. If you have questions about the dog show, call the PAWS PTI hotline for more information at 285-PAWS. It's never too late to say Thank you, so Thank You, Ron & Nancy! I'm sending a picture from our Sunday, February 24th Wing Beach excursion as you requested. Most of the obvious litter was around the parking area and the picnic areas nearby, but the rest of the beach looked very good in general. It was clear that people have been taking very good care of Wing Beach. We covered a great length of the beach and into the picnic and shaded areas adjacent to most of the beach so obviously we got a lot of old stuff along with some new. Personally I left a small bit of stuff that was being guarded by those large spiders I don't like. After two hours of hiking we only got about two large garbage bags full. Very nice to have the garbage container there. In May, I was fortunate enough to be invited to and attend TWO international animal welfare conferences in the United States. The first was hosted by the World Society for the Protection of Animals (WSPA) in Boston, Massachusetts from May 8-9. In attendance were select delegates from Bahrain, India, Mexico, Columbia, Africa, Brazil, and Saipan. The second, Animal Expo 2008, was hosted by the United States Humane Society in Orlando, Florida from May 14-17. In attendance were numerous delegates from India, Columbia, Mexico, Puerto Rico, Brazil, Chile, Italy, Belize, Peru, Kuwait, China, Australia, and Saipan, just to name a few. Both conferences exposed me to amazing people doing amazing things for animals throughout the world. This was inspiring, and perhaps much needed to re-energize our efforts here at home. The conferences were an opportunity for experts and donors to share advice, knowledge and experience on animal care/welfare issues. So, in order to better serve our community and animals, I attended numerous workshops, including but not limited to: (1) how to recognize and combat compassion fatigue; (2) how to lobby for anti-cruelty legislation; (3) how to count and recognize cruelty cases in our community; and perhaps most importantly to our success, (4) effective methods of animal control. Copies of the presentations, and more, are available for your review per your request. I invite all of you to review these materials and to educate yourself about the importance and possibility of helping Saipan’s animals and/or our community. In addition to attending numerous workshops, I want you to know that I did my best to draw attention to our situation here in Saipan. I spoke to representatives from the International Fund for Animal Welfare (IFAW), WSPS, United States Humane Society (USHS), Humane Society International (HIS), the American Humane Association (AHA), the Pegasus Foundation, Maddie’s Fund, the Petco Foundation, and many more. I also made a point of talking directly to Wayne Pacelle, the President of the Humane Society and an internationally well-respected humanitarian. What was the result? A renewed feeling of hope. I firmly believe that if we follow-up on the networking that was accomplished at these conferences, that change may be on the horizon for our animals and communities. But, PAWS and Beautify CNMI! desperately need your help in order to make these changes possible. We need volunteers. We need people who love animals to help us foster homeless animals. We need people who are interested in honing professional skills to write letters and/or lobby on behalf of Saipan’s animals. We need people to go into schools and give 30-minute presentations to children about the importance of responsible pet ownership, compassion, and understanding animal behavior. We don’t want all of your time. Just what you can give. And, if these tasks scare you, or you think you don’t know enough to jump in and help – not to worry!!! We are more than happy to either train in what we know or look for answers together. If there is one base-line lesson that I learned by attending these conferences it is this – if people living in the deserts of Peru and Kuwait or the bush of Africa can muster up the strength and resources to combat animal control and cruelty, then we can do it too and we have little excuse not to. Thanks to Aya-san and Willy-san of Isa CNMI for keeping the Beautify CNMI "Beauty Virus" alive and well! Gus and I got our niece and nephews together and headed up to the Last Command Post in Marpi, Saipan, this bright Sunday morning for a cleanup with Isa CNMI and 200 visitors from Japan. They are members of the Nenpoushinkyou group in Japan. They say they have 800,000 members. WOW! I put together this slide show of the day's events. The first 100 or so pictures were taken of the cleanup. The last pictures are of the first blooming flame tree of the group we planted on lower Dandan Road (the road leading up to Dandan from the Welcome/Adios Sign). We planted these trees last year, and now one of them is already blooming! The last pictures are of the road sign on Tun Kiyoshi Road. Thanks to everyone who pitched in to help. Isa CNMI's Aya-san and Willy-san Matsumoto led the effort with Beautify CNMI and her coalition partners MVA, PDI, Tasi Tours, RC&D, PEW, and community members. In addition to Gus and I and our niece Sheena Saures and nephews Peter Saures, Franklin, Josiah and Jun Lizama, other community members who were there included Juanita Fajardo and her niece Breana and nephew Vince. Once, again, thanks to everyone for a fine job! Arigato-gozaimasu! 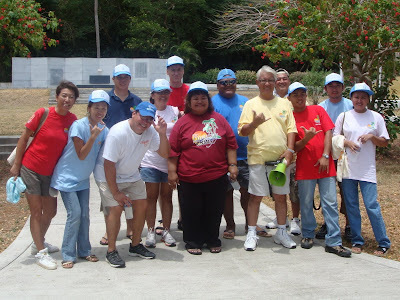 This morning Isa CNMI and other Beautify CNMI volunteers cleaned up several of the Japanese memorials in Marpi with MVA, some of the Japanese tour companies, and over 200 Japanese tourists. Go us! 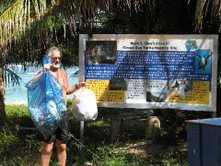 Marites Aquino Castillo, president/chairwomen of the volunteer group known as Friends of the Mariana Islands (FMI), and Angelo O'Connor Villagomez were recently presented the Earth Team Volunteer Award and Certificates for their environmental efforts. Castillo received two awards, one for herself and the other one for the FMI Group's activities. Villagomez's's genius is as a grass roots organizer, while Castillo's Group, the FMI, provided the muscle and backbone for the Earth Team Volunteer activities with over 6,000 volunteer hours so far in 2008. According to Castillo, the FMI group began consistently cleaning up of roads and beaches in June 2006. Since then they have cleaned up Lau Lau Beach every third Sunday of the month, which now amounts to 23 consecutive months of activity. During these same months on every second Sunday they were also cleaning up ISA Drive Rd. from the Saipan Botanical Gardens to the stoplight Intersection that leads to Northern Marianas Colleges. The FMI has also worked other weekends beautifying other parts of Saipan. Archaeologists Jason Burns and Michael Krivor of Southeastern Archaeological Research, Inc. will present the preliminary results of an underwater survey they recently completed under contract with the CNMI Division of Historic Preservation. The survey targeted the waters off the western coast of Saipan including those adjacent to the World War II invasion beaches stretching from Agingan Point to Quartermaster Road. These beaches and the adjacent lagoon and offshore waters were designated a National Historic Landmark by the U.S. National Park Service in 1985. Burns and Krivor will show photographs of the various historic resources that were located during their survey including World War II-era ships and airplanes. They will also answer questions from the audience. The lecture, co-sponsored by the NMI Council for the Humanities and the Division of Historic Preservation, is open to the public and free of charge. 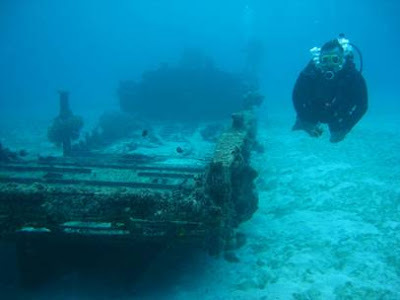 For more information about the project and the team visit the Museum of Underwater Archeology web site and my previous post on Saipans Underwater Historical Trail following the lecture by Jennifer McKinnon at Porky's. The people behind the Beautify CNMI coalition wish to let everyone know they are tired of picking up trash. They're not going to stop because keeping the Commonwealth looking clean and pristine is our only hope for attracting tourists. It also makes for a better place to live and work! So for all of you out there that still think it's OK to litter or that all these beach clean ups are fun - think again. We're tired of picking up trash. If no one litters we can turn our efforts to something more rewarding like painting over the graffiti! Hmmmmm another PSA perhaps!